How often should you train? How long do you need to rest between training sessions? How much is too much and how much is too little? The answers may surprise you and even change how you train! One of the most basic questions in weight training is "how many times a week should I train for best results?" EVERYBODY has wondered this at some point in their training career, from the complete beginner to the most advanced professional. The answer could very well change the way you train forever. And the answer is simple... it depends! Now, this is an answer that always leads immediately to the next question... depends on what? At this point, most instructors or training manuals will go right to the stock response of "train each body part twice a week" or something to that effect. It's easy to believe this is the best answer because that generally works okay for most people. It's a safe answer. But it's not the BEST answer. Learning what IS the best answer will help you cast out preconceived notions and determine what REALLY works best for your body. There are a number of factors that influence how often you should train your muscles. Each single factor plays a part in how often you should train, and they ALL interact with each other. We will go through the factors and then give you real-world examples of how these factors come together to help you determine how often you should train. "The harder you push yourself in your sets, the less frequent your training should be as this will tax your recovery systems more strongly." Training volume is basically how much you are doing for each body part. It's the number of reps and the number of sets you are doing. The more sets you do for a body part, the less frequently you should train the body part to give it a chance to fully recover. If you do fewer sets, you can train more frequently and recover from it. This is not the scientific definition of intensity (i.e., how close the weight you are using is to your one rep max for that exercise) but rather your effort intensity. Basically, it's how hard you're working your muscles. The harder you push yourself in your sets, the less frequent your training should be as this will tax your recovery systems more strongly. How much you eat and, more importantly, WHAT you eat plays a critical role in how often you can and should train. Don't think nutrition plays a big role in training frequency? Eat nothing but Pop-Tarts® for a week and see how often you're able to train... The higher the quality of the food you eat and, to some degree, the more food you eat, the better you'll be able to recover and the more often you'll be able to train. By nourishing your body with high-quality food like lean proteins, complex carbs and quality beneficial fats, you'll be able to recover and train at a faster rate. When it comes to recovery, everybody is different...some people recover slowly while some recover very quickly. This difference can be heightened by outside activities and stresses to the body. For instance, a construction worker, who has a physical job, will need more recovery time than an office worker. Playing intense sports will also affect recovery ability. Therefore, the slower your recovery rate and/or the more outside activities you do, the more time you will need between training sessions. Which exercise is most demanding to the thighs and the whole body in general... a barbell squat or a leg extension? The squat… of course. This exercise uses far more muscle and a larger load on those muscles. This creates more muscular damage, which in turn takes longer to recover from. The more demanding the exercises are on a body part (or the whole body), the less frequently you can effectively train that body part. The bigger the body part (i.e., back, thighs, and chest), the more recovery time it may need. It may not be the actual damage to each muscle fiber, but the total number of muscle fibers damaged. Recovery also has to happen at the nervous system as well as the muscle fibers and training large body parts also challenges the nervous system. All things being equal, smaller body parts many times can be worked more frequently because they have less muscle mass that needs repair. Partials, negatives, and other intensity techniques are going to affect how frequently you can effectively train a body part. These styles take more recovery time for the muscles and will require a decrease in training frequency. One of the major reasons lifters use supplements is to recover faster and more completely. 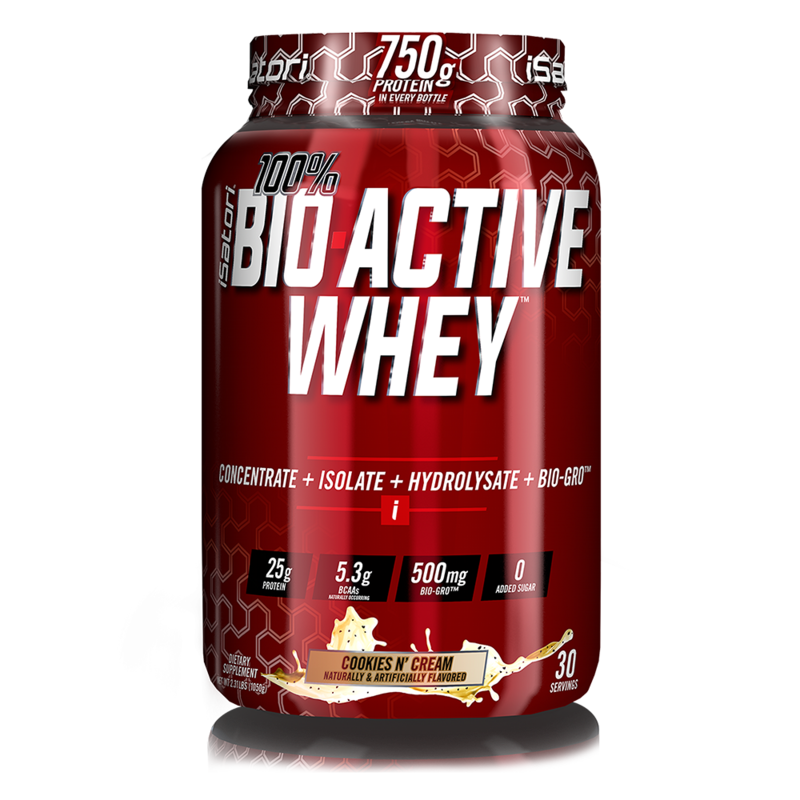 Ample amounts of protein from the likes of 100% BIO-ACTIVE WHEY™ can provide the building blocks for muscle recovery. 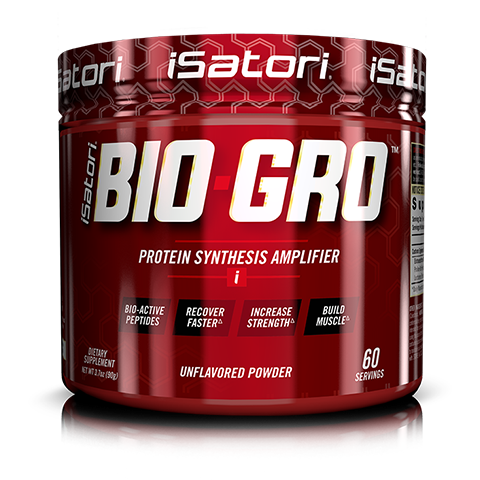 BIO-GRO™ Bio-Active Peptides speed recovery and muscle growth by increasing the rate of protein synthesis for faster recovery. This shortened recovery cycle can lead to training more frequently and faster results. These simple lists will show you the directions in which each factor will take you. All the factors interact to give you the best solution as to how often you should train. These are the major factors that determine optimum training frequency. Though the interaction of all these factors may seem complex, when you get right down to it, it's actually quite intuitive. A good way to demonstrate this is by using specific examples in different phases of training that you been in. You will see, according to all the different factors, how training frequency and training schedules get manipulated to maximize results. You will also see that the common conceptions and "rules" you have been told you must stick to in terms of training frequency (e.g., twice a week) are based only on simple assumptions, not on actual situations. Because of the specific job conditions the frequency of training is adjusted to three sessions per week with a reduction in total training volume. You can switch to total body or close to total body workouts on each of the three days (Monday, Wednesday, and Friday), using the heaviest exercises for each body part for 3 sets of 8 to 10 reps each (e.g., squats, bench press, bent-over rows). Don’t push my muscles to complete failure in my training, so I didn't beat myself down too much in addition to the heavy manual labor job. It was a simple program but very effective. It gave me enough recovery time because the volume was low and the intensity was moderate, even though the frequency for each body part was three times a week. To maximize results when you are off, you can dramatically increase training volume and frequency and utilize intensity techniques regularly. The catch? Since you are basically only eating, sleeping, and training, you should be able to recover from this high frequency and make excellent gains in strength and muscle mass. Some people in this situation are known to be in the gym 6 days a week, sometimes twice a day, doing total-body workouts EVERY SINGLE TIME. This amounts to up to 12 total-body workouts a week, in addition to intensity techniques. The actual training volume (number of sets) in each workout may be fairly low (3 or 4 sets per body part), which allows you to get results from that very high frequency. Recovery is optimal; the high frequency of training can work in your favor and allowed you to get great results. But would we recommend this type of program to someone working a physical job or without optimum nutrition or rest in quality or amount? No chance! Having an office job isn’t physically demanding, allowing for good recovery. Nutrition, however, can often be hit-or-miss due to busy scheduling. There may be times, when work demands dictate the needs to put in hours after regular time, which can force you to push workouts back to the next day. To maximize the results with this situation, you could change to a "one-body-part-per-day" training system. Do a single body part in a workout, working it with high volume and high intensity. The next day do a different body part, rotating continuously through all the major body parts. Because you are only working one body part at a time, the training frequency was very low, basically working the target body part once every 7 to 8 days. This, of course, would increase if I had to bump a workout back a day. In layman’s terms, you basically "destroy" the single body part in its workout with high volume and intensity, this low training frequency gave my body enough time to recover and rebuild the muscle. It would take that much time for the part to recover. Also, when you work one body part, other body parts are invariably involved, allowing for indirect stimulation of the other muscles more frequently; i.e., when you bench press for the chest, the triceps are also involved. This plan gives you the flexibility to easily change workout schedules without compromising results even with less-than-perfect nutrition. As you can see, optimum training frequency is nothing as simple as "work each body part twice a week." The give and take between a number of different factors in your life and schedule will help you determine how often you should be training and the type of training you should be doing for best results. And remember, using BIO-GRO™ Bio-Active Peptides daily will accelerate your recovery time so you can get back to the gym sooner and reach your goals faster. Use BIO-GRO twice a day and stack it with Morph (before you train), AMINO-GRO (while you train) and 100% BIO-ACTIVE WHEY™ (after you train) to complete your training/recovery stack.